This is a relatively soft splint and the panels allow for flexibility for movement. It is comfortable in standing and sitting and allows for the natural curves of the body. 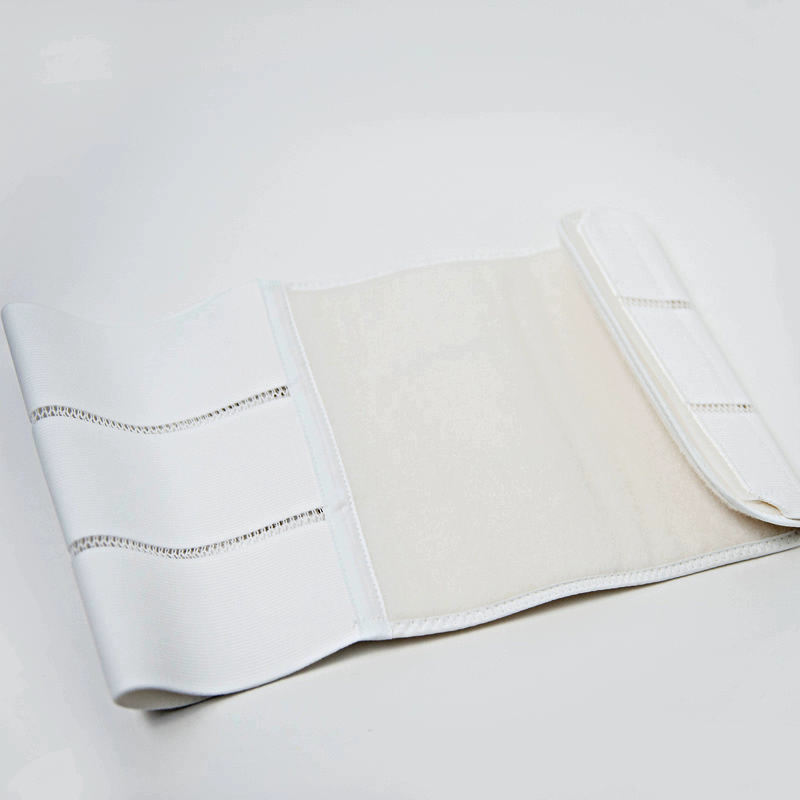 We use this splint in pregnancy as well since the panels allow it to securely conform around your growing belly bump. When fitted properly, this splint overs full coverage and good facilitation for your transverse abdominis. Measure yourself for the right splint here. I tried many different splints and belly binders, and they all drove me crazy. I invested in this one and started their core rehab program, and I am finally seeing results. I was afraid at first, but I wore the splint as instructed and it didn’t bother my prolapse at all. AND, it helped quickly close my diastasis. Whew! Will a splint help heal my diastasis recti? Splinting will bring two sides of the separated abdominal wall together, placing the connective tissue in a lax position to speed up healing. 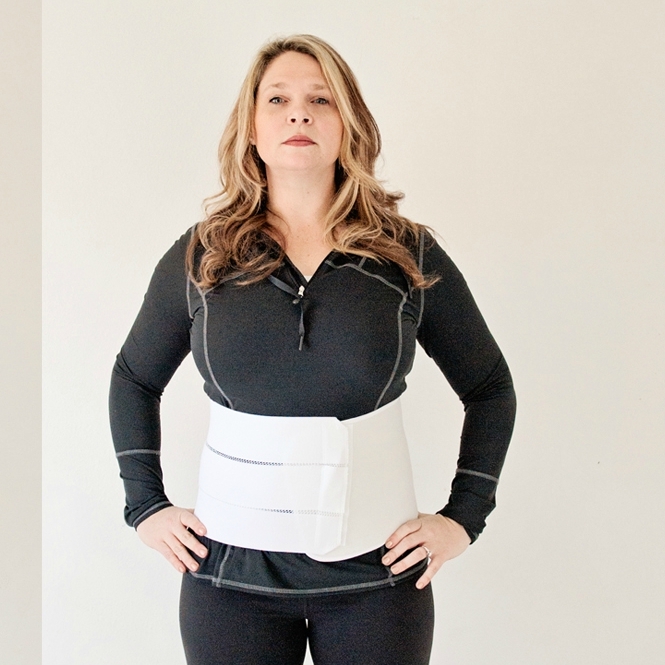 The Tummy Team has been reversing diastasis recti for years and believes the comprehensive approach of splinting alongside a rehab program will bring the best results. Our programs include postural retraining, strengthening, and alignment to help heal diastasis recti. 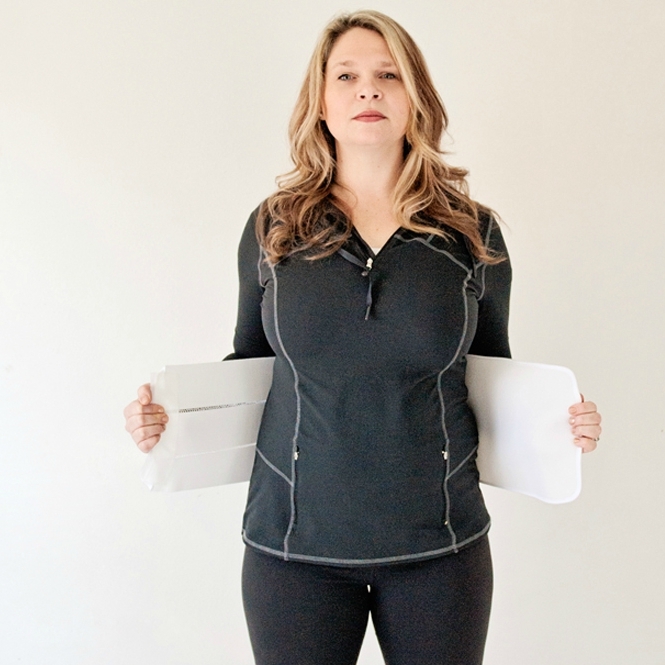 While splinting alone will not heal a diastasis or rebuild your core, splinting plays an essential role in the process and can make a big difference in your recovery. Should I splint even if I don’t have diastasis recti? You do not need to have diastasis recti to benefit from abdominal rehab splinting. The abdominal splint acts as a pair of training wheels for a weak and disconnected core, offering assistance until your postural muscles are strong enough to hold you up effectively throughout the day. The splint provides the sensory feedback to help you understand how your core should function. Splinting without rehab, or splinting for months at a time, is not recommended for optimal healing. Can I use a splint without a program? Splinting can be an essential part of healing and restoring your core muscles. However, most people don’t realize that abdominal splinting alone will not rehabilitate your core. In some cases, the incorrect and/or long-term use of a splint can make matters worse. The splint is designed to be a temporary transverse muscle during the process of rehabilitation so that you can wean from the splint and ultimately have a strong, rehabilitated core. The Tummy Team offers several online programs that take you through a step-by-step process of restoring your core so you can live a core-strong lifestyle. This is always the ultimate goal of splinting. My doctor says splinting will make things worse. Is that true? Many professionals think splinting too tight, for too long and without rehab can lead to muscle atrophy, disconnect, and dependence on the splint. Consider abdominal splinting as you would consider using a wrap on a sprained ankle. If wrapped too tight, left on for too long, and if the muscles were never trained for walking, then it would be ineffective. But when used properly – with the right amount of support for an intentional amount of time and while encouraging the client to safely use the ankle – it can be a very effective way to assist the rehab process. The Tummy Team uses Abdominal Rehab Splints with 90% of our functional core rehab clients as a portion of the rehab process. If your care provider has concerns, please encourage them to look at the information provided on our website for professionals. What are the guidelines for splinting after a cesarean or abdominal surgery? Always consult with your surgeon regarding their timing for splinting. Generally, as long as there is no drain or infection, clients are safe to splint immediately after the procedure. We recommend always wearing a layer under the splint against the skin. While fastening the splint, be sure to exhale and engage to be sure the splint is snug like a hug around your tummy. Gentle steady pressure often feels supportive. If you have any hypersensitivity to the area, start to address that by placing gentle counter pressure along the incision for a few minutes several times a day to help the nerves calm down. Always listen to your body. If splinting ever makes you feel worse, take a break. What is the correct way to use a splint? Wear the splint all day during the initial weeks of core rehab training. 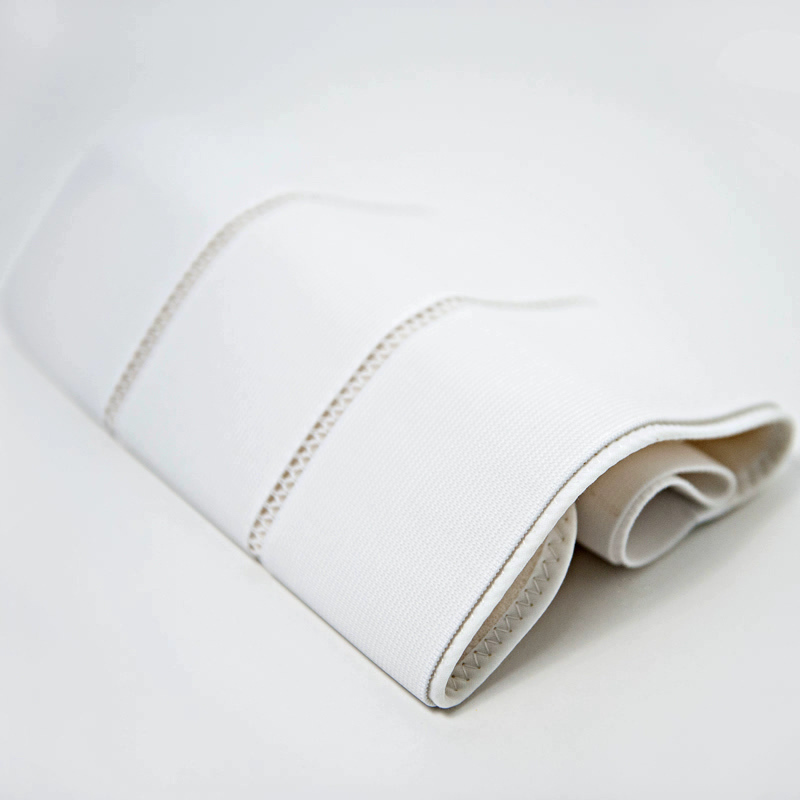 Wear the splint over a camisole, undershirt, or bellyband to limit skin irritation and decrease the need for laundering. Splinting is only a portion of core rehabilitation. How you wear your splint and hold yourself while splinting is key to extending the life of your splint, and, ultimately, your recovery. Focus consistently on slightly drawing your navel in away from the splint, NOT on resting into the splint. Remember that the splint is meant to be temporary and helps place the muscles in proper alignment for rehabilitation. The transverse work you perform through exercise, posture and alignment, and functional activities is truly how the muscles heal and rebuild. Splinting without the guidance of a Core Rehabilitation Specialist (or one of our online programs) is not recommended. How much of the day is splinting recommended? In most clients, we recommend abdominal splinting for most of your waking hours, every day for at least the first few weeks. It takes time to build up the tolerance for a splint while learning to engage and elongate your core, so give yourself time to get used to the splint during the first week. Remember that splinting is only a portion of core rehabilitation. How you hold yourself while splinting is key to your recovery. Focus consistently on slightly drawing your navel in away from the splint; don’t rest into the splint. How long should I use a splint for? The Tummy Team recommends clients splint consistently during their waking hours for the first 2-4 weeks of your rehab program, depending on the severity of your weakness. During our program, we will guide you in the process of weaning from your splint while encouraging you to use your transverse muscle more and more. Remember that the splint is meant to be temporary and helps place the muscles in proper alignment for rehabilitation. The transverse work you perform through exercise, posture and alignment, and functional activities is truly how the muscles heal and rebuild. Should I use the splint while I sleep? Some clients who have a very severe diastasis may want to continue wearing it at night during their rehab process. If you have any kind of pain at night that is keeping you awake or pain first thing in the morning, then splinting at night can be very beneficial. However, sleep is a very important part of healing so if the splint doesn’t help you sleep, then don’t wear it. Remember, splinting is only part of the rehab process. How do I put on a splint? If you are enrolled in an online rehab program, we will demonstrate this to you in the first set of videos. Otherwise, here are some instructions. Place the splint between your ribs and pelvis. (Overlap onto the ribs or pelvis is okay; just make sure the splint covers the main part of your abdomen). Stand with your feet hips’-width apart. Untuck your pelvis and keep your ribs aligned over the pelvis. Exhale and draw your navel to your spine. Pull the two sides of the splint across your middle and fasten the closure. It should be snug like a hug, but NOT tight like a tourniquet. You want supportive, but not restrictive. Can I wash the splint? Yes. However, over-washing will compromise the velcro and lead to the splint being ineffective. Keep laundering to a minimum by wearing the splint over a camisole, undershirt, or bellyband. To launder, connect the splint by its velcro closure, hand wash, and then machine dry on low. How long will a splint last? Our splints should last about 12-16 weeks and are not intended for long-term use. We recommend wearing it over a camisole or undershirt to decrease the need for laundering which compromises the velcro. Should I use a splint postpartum? Outside of the United States, most cultures choose to splint, or “bind,” the belly after delivery. We believe it helps to reconnect and protect the stretched-out abdominal muscles. And because new mothers are generally more focused on caring for their newborns than tending to their tummies, a splint works wonders without much extra effort. Splinting immediately after delivery as well as the first few weeks postpartum can help with healing, reconnecting to your core, back pain, and even postpartum depression. For best results, we recommend using a splint in conjunction with our Core Foundations Rehab Program. Can splinting during pregnancy help heal/prevent diastasis recti? 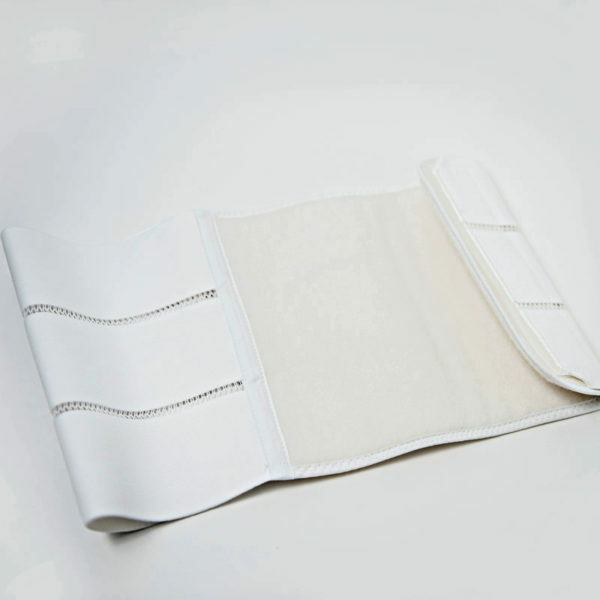 An abdominal rehab splint wraps around to support your corset and your transverse abdominis. It can help reverse your diastasis recti during pregnancy by bringing the two sides of the separated abdominal wall together, placing the connective tissue in a lax position to speed up healing. We recommend splinting if you have significant diastasis recti (3 fingers and deep, or more). If you have a severe diastasis, your abdominal wall is not strong enough to support your growing uterus without complications like a hernia. The splint will help protect your tummy from further damage. 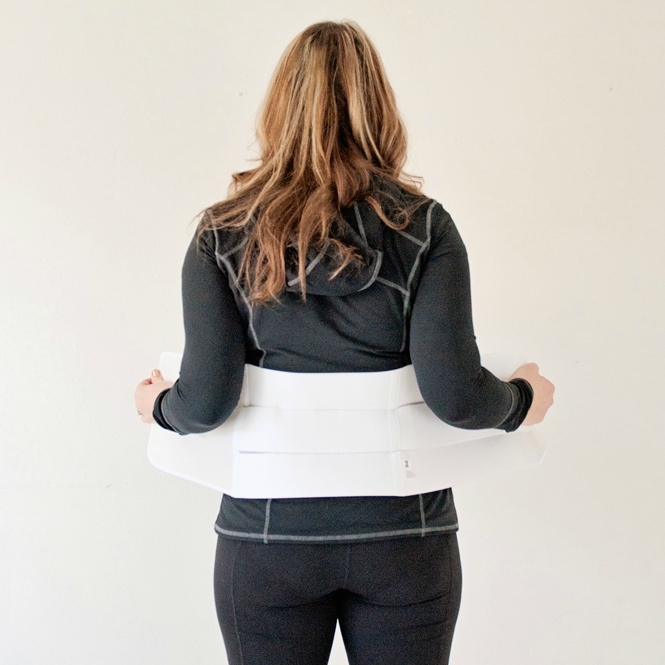 The splint can also help reinforce the corset muscle which can help alleviate back pain, hip pain, pregnancy-related abdominal pain, sciatica, SI joint instability, and much more. Can splinting during pregnancy help with fetal alignment? Abdominal splinting is highly encouraged to support optimal fetal alignment. When your core is strong and working as intended to support a growing uterus, it places your baby in optimal alignment – head down and aligned vertically with the cervix and birth canal. However, if your core is functionally weak, then the splint can help pull the baby up and in, placing the baby in better alignment. This position puts the least amount of unbalanced stress on mom’s body during pregnancy, alleviating common pain symptoms. But optimal fetal alignment also sets the stage to place effective pressure on the cervix to stimulate and intensify contractions, therefore steadily progressing labor. Wearing a splint even during contractions and the pushing phase of labor will help keep the baby in optimal alignment and helps you coordinate the necessary muscles to effectively push the baby out. Can splinting help with poorly positioned babies (breech or transverse)? Yes. The splint will help pull the baby up and in which puts the womb in a tight position. However, this won’t give a baby in a poor alignment room to flip and turn later in pregnancy. So if you are late in your 3rd trimester and know your baby is not in optimal alignment, take a break from the splint and give the baby time to move. Once the baby is flipped and head down, then splinting can help keep the baby in the right alignment leading up to labor. Should I wear a splint instead of an SI belt? A splint is a great addition or alternative to an SI belt (a belt that helps stabilize a hypermobile pelvic bone). However, SI belts are not very comfortable during sitting or some movements. The abdominal rehab splint will support the pelvis in a very similar way, but is much more comfortable and flexible during movement. Should I wear a splint instead of a maternity support belt? Maternity support belts are not recommended because they don’t support the abdominal muscles well and require you to rest into the belt to get any support. Instead, an abdominal rehab splint will reinforce what your muscles are meant to do and will promote optimal alignment. If you ordered a splint and it does not fit as expected, or you changed your mind, you may return or exchange it so long as it does not show signs of wear, and is in resalable condition. *The quickest way to replace a wrong splint is to order the correct one from our website immediately, while you ship the incorrect splint back for a refund. *Manufacturing Flaws: If there is a manufacturing flaw in your splint, we are happy to replace it. Please call us to arrange a replacement. Do you ship splints internationally? Yes, we do! Most of our international customers have received their splints in 2 weeks, however, bear in mind that we cannot control how long the item remains in customs. You will have to pay the cost of international shipping, which is a flat $15 fee. Which Tummy Team splint should I purchase? Our splints are custom made to fit a variety of shapes and sizes. It is important to accurately measure yourself for the best fitting splint in order for it to work properly. You can find those instructions here. Do I have to purchase your splints? Or can I get it elsewhere? The benefit to our abdominal rehab splints is that they were designed with rehab in mind. They are comfortable and supportive without being restrictive. If you choose to shop elsewhere for an abdominal splint, here is our recommendation. The splint should feel “snug like a hug” and supportive, not tight and restrictive. The splint should allow you to be able to sit and stand in alignment without difficulty. The splint should always reinforce the feeling of a connected core. The splint should make symptoms improve not worsen. Will a Tummy Team program relieve my lower back pain? Most likely. The number one response of clients in our programs is relief from lower back pain. A strong core does a great job of taking the pressure off your back. We’ll show you how! I don’t have diastasis recti, but I know my abdominals and back are weak. Is a Tummy Team program right for me? Yes! Whether you have diastasis recti or a poorly functioning core, our program can help you. Our comprehensive programs address pelvic floor dysfunction, chronic back pain, hernias, digestive issues, and so much more. Explore the What We Do section of the website to learn how we can help with other symptoms. Can I bill my insurance for an online program? At this time, medical insurance companies do not cover online services. However, many FSA/HSA accounts will reimburse the cost of your program. Please verify that your plan will allow reimbursement. You can contact us for supporting documentation to provide to your insurance provider by emailing orders@thetummyteam.com. Do you offer a sliding scale payment option? We set aside a number of partial grants for clients who are in financial and physical need. We offer these on a case by case basis and determine the cost of the program or splint based on the specific situation of each client. If you feel you might qualify for a partial grant, please reach out to our staff at orders@thetummyteam.com.